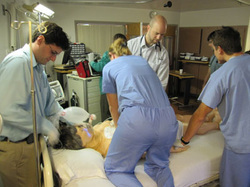 The Code II Training is a 4-hour course designed to prepare nurses and respiratory therapists for their roles on the hospital's Code II Team, including responding to outside events on the hospital grounds. The course begins with a discussion/classroom portion to review specific Code Team role responsibilities and expectations, resuscitation medications, American Heart Association 2010 ACLS updates, First Response skills, effective communication techniques, and a review of current Code II data at Regions Hospital. In efforts to reinforce the classroom content, participants will act in their assigned Code Team role in a simulated mock code event. Each simulated mock code is followed by a debriefing session to discuss the event in more detail. The course is structured to offer an interactive learning opportunity to practice specific Code Team roles, effective communication techniques, and develop team skills in a realistic setting. computer's volume is turned up. 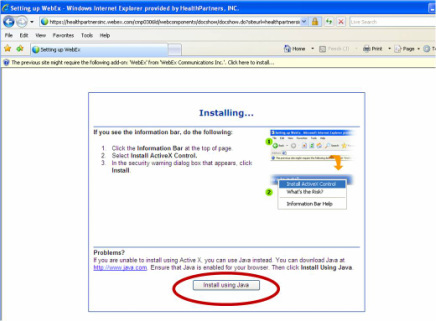 If you see a screen like the one below, click on the "Install Using Java" button shown below - circled in red. 2. Complete the Pharmacology Assessment after viewing the course. Cathy Meadows will email the link for this Assessment to you. 3. Attend the Code II Training course that you have been scheduled to attend. The online "Code II Pharmacology" program and Assessment must be completed prior to attending the Code II training. 1. Demonstrate effective BLS management. 3. Utilize recommended communication techniques. 4. Locate equipment and medications in the Code II cart. 5. Accurately documents required information on the Documentation Record. 6. Perform Code II team role effectively during a simulated code.